We arrived really early at the Grand Canyon, so we knew our room wouldn’t be ready. 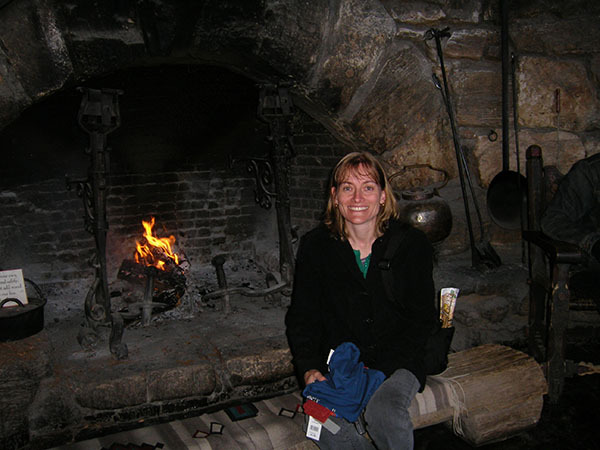 After checking out the sights in the immediate area such as the Hopi House, the interior of El Tovar, and getting our first look at the awesome Grand Canyon, we head off to venture further afield. We decide to leave the car in the carpark and take one of the free shuttles around the park. After receiving some vague instructions from a hotel employee we finally work out where the shuttle leaves from, although to start with we are standing at a railway station instead of the shuttle station. One thing we have found in a number of places is that the signage is very poor as are instructions. For instance we were told that to catch the bus, go out the door and down the stairs, I took this to mean go down the hotel steps and wait outside, but no it meant look for some stairs some meters from the hotel and go down 3 staircases. A big sign at the top of the stairs would have helped. The bus arrives at the Blue Angel Lodge depot in about 10 minutes and off we go. The shuttles actually run every 15 minutes so if you get off at a stop to take photos and have a look around, it isn’t too long before another one arrives. We get off at the Village Route Transfer and board the bus for the Hermits Rest route. This route only reopens on the first of March so we have arrived at just the right time, a few days earlier and we would not have been able to take this shuttle. The road is a bit rough so the ride is bumpy but not too uncomfortable. We are sitting in a back carriage with large glass windows which give us an excellent view of the Grand Canyon as we drive along. The first stop is the Trailview Outlook where there is a great photo opportunity back to the village and you can take a 0.7mile/1.1 km walk from this point back to the village. The second stop is the Maricopa Point and again there is a 0.7mile/1.1 km walk from this point back to the Trailview Outlook. Paula spots a fawn and a doe sitting down on the side of the road. A further 0.5mls/0.8 kms on is Powell Point which is named in honour of John Wesley Powell who in 1869, with 9 companions were the first men to take the 1000 mile journey on the Colorado River, through the Grand Canyon. 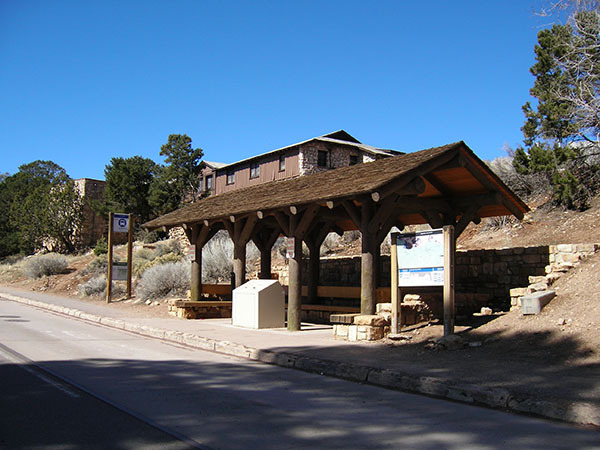 Once you arrive at Hopi Point which is 0.3ml/0.5kms from Powell Point, you can catch a bus going in either direction, back to the village or onto other stops on the way to Hermits rest. This is great for people who have limited time but still want to see the grandeur of the Grand Canyon. There are also toilets at this stop. City slickers be prepared to experience a drop toilet. 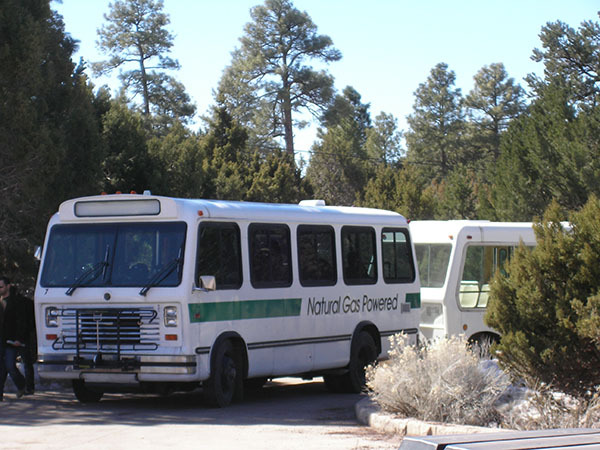 There is another return bus trip available from the next stop which is Mohave Point and this stop is 0.8mls/1.3kms from Hopi Point. The view from any of these stops is spectacular however we have decided to stay on the bus and do the hop on hop off thing on the way back. Of course the stop we wanted to visit wasn’t one of the hop off points on the way back, so make sure you check if the stops you want to stop at are available on the return journey or you will either miss out or need to take the bus around again. The Abyss was the stop I would have liked to check out as the canyon drops way for 4000 feet to canyon floor. This stop is 1.1ml/1.8kms from Mohave Point. We decided to hop off at the next stop which is Pima Point and it is 2.9mls/4.7km from The Abyss. From this point there is a view of the Colorado River which looks brown from where we are. The bus driver tells us that on a calm day you can here the river roar; however, today there is too much noise from the wind. Still we get some more spectacular photos. 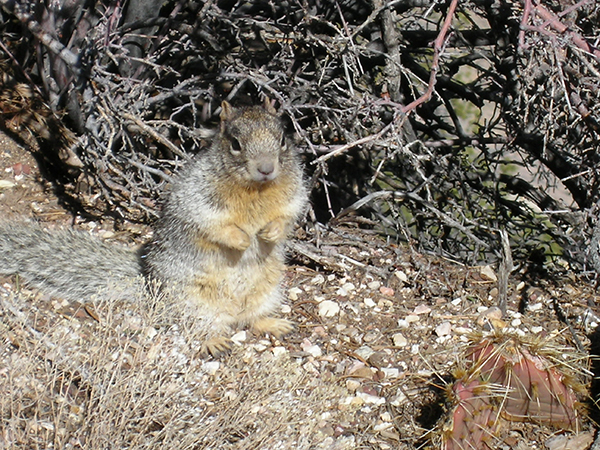 A squirrel poses for us while we take photos and he is so close we could almost touch him, if it were permitted, which it is not. There is no touching or feeding the animals allowed, and rightly so. Still he shows no sign of fear. Then it’s back onto the next bus and onto the last stop on the trip, Hermits Rest. 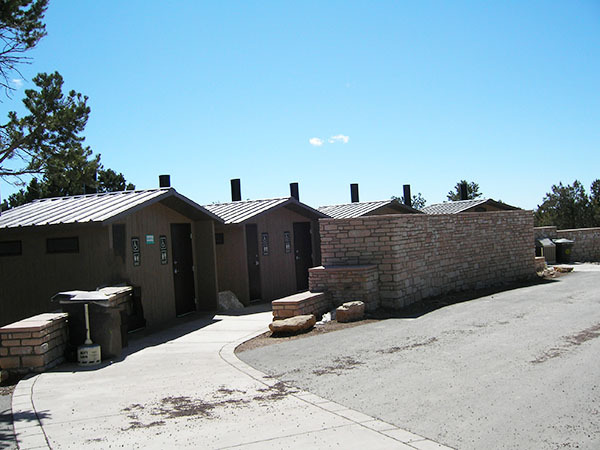 This stop is 1.1ml/1.8km from Pima Grand Canyon at SunsetPoint, and there are restrooms and a souvenir shop. 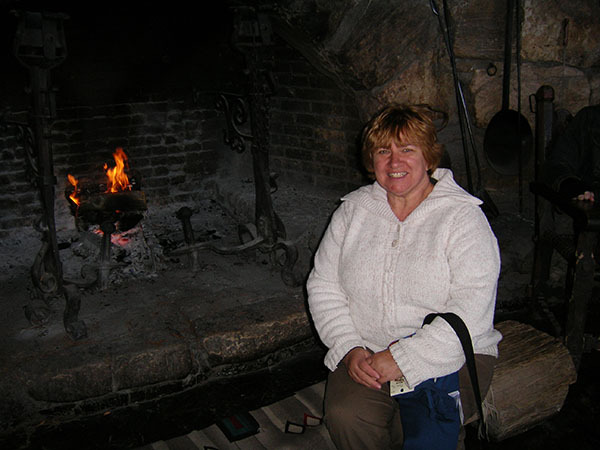 They have a blazing fire going and we stop to warm up and thaw out. Although it gets cold back home in Canberra, we really aren’t prepared for the biting cold that seems to gnaw into our bone marrow. Of course we haven’t brought the right clothing for this weather either as the bulk of our trip will be spent in California. One of the things we are impressed with is the quality of the tee shirts and how inexpensive they are. We each buy a Grand Canyon tee shirt, some warm socks and some gloves. At least we will be warm for the rest of our stay. As soon as we thaw out we head off back to the bus for the return journey. Coming back the lady in front spots an elk and we see another couple of deer. Soon we are back at the transfer point and we decide to walk back to our lodge. Paula suggest we take the Blue Angel trail back but as we set of down the sludgy muddy path she remembers having seen a sign that says the hike is 8 miles. It’s also very slippery as the ice has melted on the downward slope and after tentatively making our way down a short distance, we turn back. It’s the best decision we realise as a hiker comes by with snow shoes and ski poles. Our walking shoes aren’t up to this so we backtrack onto the rim path which is a nice easy walk back to the hotel. 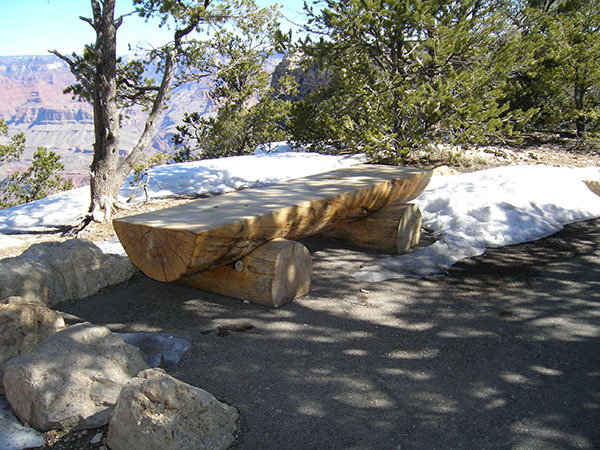 There are log seats scattered through the park where you can sit, relax and look out over the Canyon. Careful though, at this time of the year you might end up with a wet bottom. Maybe in the summer, at these temperatures, in this bitterly cold wind, I’m happy to keep on walking. A fantastic way to view the Grand Canyon is by Helicopter and this is something we will definately do the next time we are here.